Up against pressure to incorporate more renewable energy sources, Hawaiian Electric is trying to show they are working on grid integration with numerous battery energy storage system’s (BESS). The following demo project will run for two years, but is that too little too late? They may not understand how fast the energy storage and microgrid markets are moving. Without large-scale, rapid deployments they are likely to see early impacts of grid defection before the results are in. The Project is a joint effort between University of Hawaii’s ‘Hawaiian National Energy Institute (HNEI) and Hawwaian Electric. The US Navy’s office of naval research provided a research grant to purchase the plant installed by Hawaiian Electric. According to the video, the purpose of the battery project is to demonstrate and evaluate the effectiveness of substation Battery Energy Storage Systems (BESS) for photovoltaic (PV) integration on a distribution circuit. Hawaiian Electric provided the location. They are also evaluating algorithms that can help integrate renewable energy in the future. 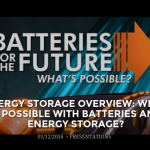 Energy Storage Overview: What is Possible With Batteries and Energy Storage?